Are you thinking of introducing a new dog into your home but confused about what type of dog would suit your family and lifestyle? Perhaps you can’t decide whether to give a home to an adult dog or puppy and need a little more information or advice before making a decision? Read on to learn some interesting facts about common dog breeds and the traits that they can bring into a family home. Every dog will either be a pure breed, or if a cross breed, its looks and behavior will show what type of dog it is genetically related to. When you choose a dog it is certainly important to try and match its needs to your own needs as an owner. By taking the fundamental needs of breeds of dogs into consideration you are most likely to succeed in your choice of new dog. Here are some useful tips to consider when finding a dog to take home. Research the breed type of any dog that you are interested in. Learn from the internet and other dog owners any problems that they have needed to deal with when living with a dog of this particular breed. Find people that already live with a dog of this breed and ask if they have any common problems. Carrying out some research will ensure that you are expecting the breed traits that your new dog may show in your home. You can also recognize common health problems if you know what to look for when choosing your dog. An example of this could be the gait of a German shepherd dog which to the informed eye can show quite obvious signs of severe hip problems. Find out the exercise needs of the dog that you would like to take home and match them to your own exercise routines. It is worth researching how much mental stimulation a dog needs too as all dogs are different but animals of the same breed can show striking similarities. Some dogs are built to run for miles and enjoy long challenging walks. Other breeds of dog are happy with shorter walks and lots of relaxation time. When choosing a dog it is important that you are honest with yourself about how much exercise that you can realistically offer. A dog that needs a lot of exercise can develop problems within the home if its basic exercise needs are not met. Mental needs of pet dogs also vary greatly, some will become bored quickly and demand attention and others are happy to relax for most of the day. Decide how much time you have to offer for dog training needs and match these to the needs of the dog you choose. This careful planning will be worth it long term. Dogs originally bred to work will have traits and needs, sometimes diluted, that will need to be met to ensure happiness in the home. If you like a dog that was originally or still is a working breed then you can get an idea of how it will behave by looking into its role when employed. Look into the breed and find out whether it is still bred to work now or predominantly a pet. Some dogs have working type and show type; this includes the cocker spaniel and Labrador. Both of the aforementioned can offer very different types of same breed dogs. Careful consideration of breed type with view to the dog performing a function will give you an idea of how much mental and physical stimulation that the dog may need in order to stay happy and fulfilled. An example of this is the Border collie who is a popular pet and can behave perfectly in the home when its needs are met. The collie however is bred for rounding up and herding sheep therefore has a lot of energy so will need a lot of exercise and mental stimulation to be happy in a family home. Choose your new dog with care and careful consideration, the little extra time spent on research will help you to understand both whether a dog is suited to you and why he behaves like he does. 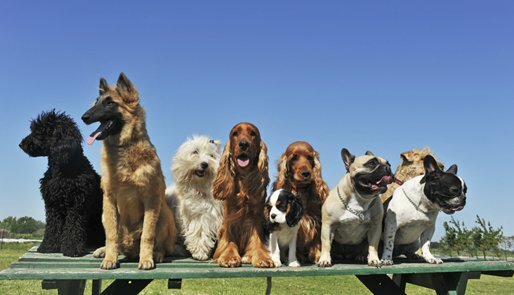 If you would like access to a great community of dog lovers to share your questions please visit our friendly and information packed dog forum. The golden retriever is a nice dog to raise and train. Resembling a bear cub as a puppy the retriever will grow into a loyal and humorous companion with stunning looks. This breed of dog is rarely complicated and usually responds well to praise and food reward. Originally bred to retrieve game birds and waterfowl the retriever is often seen proudly, yet gently, carrying a toy or shoe. If you have decided to introduce a golden retriever puppy into your home then you are in for a treat. Watching this breed of dog grow into a mature adult canine is fantastic. The retriever is honest and faithful. He is a dog of little complication and you will enjoy him. To help your new puppy grow into a well-rounded adult you will need to provide him with everything a puppy needs. Golden retriever puppy training is just the tip of the iceberg. Dog training establishments often organize puppy socialization classes. 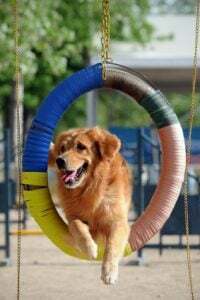 Frequently these classes are catered to all breeds of puppy and not simply golden retriever puppy training. You could take your dog along and allow him to spend some time with other puppies of his own age, all shapes and sizes of dog. By attending these organized groups your dog will learn how to interact with other dogs and this is crucial to his development. 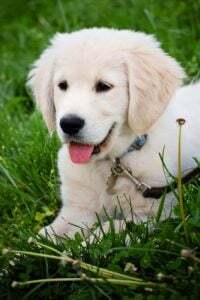 The main thing to remember with golden retriever puppy training is that your small and light puppy will grow into a big strong dog. You may be able to lift him at the moment and jumping up can seem cute. A large untrained retriever can be weighty and quick to use it to his advantage. Sitting on you or jumping for food with no malice can still become a nuisance. So it is a good idea to work on the behaviors that are most likely to become a problem as he grows. The retriever really is a lovely breed of dog. He has a huge smile which he is not afraid to use and is an easy going pet even from a young age. Leash walking is an important part of golden retriever puppy training. It is amazing how many adult dogs that have always pulled on the leash are expected just to “heel” on command. When he was a puppy the retriever pulled, as he grew the pulling became stronger but still not much of a problem. Suddenly a dog of 40kg dragging his owner along seems to come as a surprise. Introducing your puppy to a collar can be a little traumatic, but he will soon get used to it. By using positive dog training you can associate food reward, to improve your dog’s acceptance. Place the collar on the ground and give your dog chance to look at it, reward him when he does. Place the collar very loosely around your dog’s neck and give praise and treats continuously to prevent distress over the collar. When the collar is on simply ignore it and any scratching or attention that the dog pays to it. Repeat this over a number of sessions until eventually you can leave his collar on for longer periods without him paying any attention to it. Stages based on the ones above can be used to introduce your puppy to many new things. Remember to keep things positive, reward based and fun. Positivity is the only technique to use within golden retriever puppy training. The German shepherd is a charming puppy. Loyal and humorous the shepherd is cute as a youngster and dignified as an adult. All puppies need socialization and basic positive learning experiences in order to grow into well rounded dogs. The German shepherd is no exception. If you have a new German shepherd puppy or are thinking of getting one then you will not be disappointed. A loyal and brave dog with intelligence and attentiveness the Shepherd is a great canine companion. There are guidelines that you can follow to ensure that your new dog grows into a happy and well trained friend. German shepherd puppy training should be complemented with suitable socialization. The shepherd by nature can be reactive and protective when scared therefore he must be introduced to as many new things as possible, from a very young age. With socialization of a puppy you are teaching him that there is very little to fear in the world around him. A puppy is generally friends with everyone and everything when he is born. If he learns to fear particular things as he grows into an adult dog then those fears will stay with him forever. This fear can be just as intense for the dog if he has few social experiences as a puppy. A natural reaction from an under socialized dog is fear. This reaction can be very difficult to modify in an older dog. A puppy that has many different experiences that are all pleasant and stress free will grow into a confident and happy dog. The German shepherd puppy that is allowed to play at the park, with other young dogs (and under supervision) will benefit greatly. Also, playing with adult dogs will teach your puppy manners and etiquette. Socialization should begin as soon as possible. The first few weeks of a dog’s life are crucial for learning. There are mixed opinions around taking an unvaccinated dog out of the home, but a puppy tucked under your jacket is still getting social experience. If you are happy to carry your dog into social situations before vaccination then it is well worth the effort. Travel in moving vehicles – this is especially important because a German shepherd can be prone to barking during travel. You can obtain a socialization CD to play in the background at home. Fireworks, storms and other noises that may cause stress will then be introduced to your dog slowly until they are simply not noticed at all. Training your dog must always be a positive experience for him. German shepherd puppy training must be based on reinforcement and reward of good behavior and non-acknowledgement of unhelpful behavior. Reinforce – Pinpoint the behavior that you would like your puppy to repeat then instantly reward. Ignore – Any unhelpful behavior must not be acknowledged at all. By ignoring any behavior you are showing the puppy that there is no point displaying that particular behavior. The dog will soon look for something more rewarding to do. The above technique can be employed within dog training in most circumstances. For instance toilet training, by taking your puppy outside and ignoring him until he toilets, then instantly rewarding him, you are encouraging the behavior that you want. You can then add a cue word as he begins to toilet which you can use each time he goes out. A highly intelligent dog, the German shepherd puppy will learn quickly and thoroughly if taught properly. Remember that your puppy is a responsive and loyal blank canvas. He will be biddable and eager to learn, so it is up to you to shape him into a happy well trained dog. There will be times when you must intervene in an unwanted behavior from your puppy. If this occurs then it will be most useful to offer him something different to do. Take his mind off the unhelpful behavior by capturing his interest with a toy or something similarly distracting. Be careful though, that you don’t allow him to confuse the distraction with reward, and therefore reinforce the unhelpful behavior. 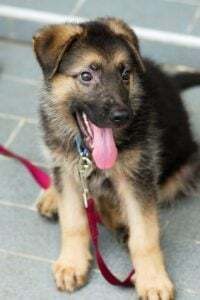 German shepherd puppy training is essential if you are offering a home to this breed of dog. A well trained shepherd is easy to live with, but untrained or under socialized the shepherd can develop fear based and reactive behaviors. How to Train a Pitbull Terrier & Understand Your Dog! Bred initially for bull baiting and used more recently for underground dog fighting, the pitbull has suffered more than its share of both bad press and abuse at the hands of humanity. The pitbull terrier is powerful and can cause substantial damage with a bite. With this and the press focused on the breed, the pitbull has acquired a reputation that is vastly unfair. The pitbull terrier is often in the news and social media spotlight. Coverage ranges from an attack on people or other dogs, to desperate owners trying to prove that their family dog is no more a threat than any other breed of dog. Social networking has allowed pitbull lovers to unite against the breed related discrimination aimed at this type of dog. Forums and blog posts draw attention to everything from flaws in the law banning these dogs to how to train a pitbull to roll on his back. These pages are filled with wonderful pictures of much loved pitbull terriers playing with young children. The breed is described in these circles as “the nanny dog” referring to its affinity with children. Laws have been passed in both Canada and the United Kingdom to ensure that the pitbull terrier is controlled when in public with both a muzzle and leash. Temperament tests are carried out on the few pitbulls allowed to live out their lives in the family home. Dogs all over the United Kingdom have been seized by officials and euthanized if resembling a pitbull. It is claimed that many lawmakers have little idea of how to train a pitbull. In reality the pitbull terrier is a biddable and trainable dog, he carries an inkling of stubborn terrier attitude alongside a sensitive streak. The pitbull wants to please his owner and is extremely trainable. Positive dog training will be required and really is how to train a pitbull terrier. This dog will become upset and worried if punished or roughly handled. One of the main things to consider with your pitbull terrier is his size. Your dog must learn good manners and control. You may know that he is a big softy, but the stranger he jumps up at only sees a huge dog attempting to dive on him. If you are training a pit-bull puppy, then he should never be allowed to jump up at anyone. It is unfair to allow your dog to jump up as a puppy as he will not know the difference in his size as an adult dog. He will not understand why you are telling him off for jumping up as an adult. At the very beginning of your lives together, you should teach your dog an alternative behavior to jumping up. A sit will be a good substitute. A jumping up dog wants your attention and by giving attention only to a sit, the dog will soon learn to offer this behavior as a replacement. You can add a further motivating reward like a food treat when he sits or you can just kneel with your dog and give him the hug that he is asking for. When researching how to train a pitbull the first thing to ensure is that you only take on board the positive training methods. Reward based training with this breed is essential. Punishment and negative reaction will distress him greatly. Looking like a strong and powerful dog the pitbull can be expected to cope easily with rough handling. He is employed in some circles as a status dog. The illegal world of dog fighting still thrives in many countries and often the pitbull is at the center of this. Your pitbull is a terrier and they are by nature reactive. But he is no more reactive than a Jack Russell terrier or a Yorkie. He is just bigger and in reality this dog will, as any other, learn according to his experiences. If under socialized, your pitbull will be frightened of things and if not trained properly, he will have little idea of how he is expected to behave. A well socialized pitbull terrier, that is taught good manners by a responsible owner will be as fantastic a family dog as any other breed. So you are having a new family pet and like the look of the Shih Tzu. A toy breed dog of sturdy build and cheerful nature that will meet and exceed your expectations. The Shih Tzu has ancient heritage. Originating from China and Tibet he is genetically one of the older dogs that we know of. It is thought that this breed originates from a cross between the Lhasa apso and Pekinese. They are rumored to have resided with Buddhist monks. The Shih Tzu is a loyal smaller dog with less likelihood to yap than other toy breeds. With relatively low energy levels he will be happy to accept shorter walks than many other smaller dogs. The Shih Tzu is interested in his surroundings and carries in his nature the expectation of grand treatment. Researching how to train a Shih Tzu and training him early in the dog’s life will usually mold a great family dog. This little dog, if socialized and trained properly will prove an excellent pet. Health problems to look out for are often based around the face of the Shih Tzu. Eyelids can turn inwards causing the eyelashes to grow into the eye. This will often need an operation to rectify the problem. With extreme breeding the eyes of the Shih Tzu can be so large that the lids cannot close to moisturize the eyeballs. Another problem to be aware of is breathing difficulties if the dog has an over exaggerated snub muzzle. Breathing can be terribly labored due to the resulting blocked nostrils. A good breeder will be able to introduce you to the puppies and their Mother and Father. The young dogs will be growing up in a family home. They will be acclimatised to electrical appliance noises and visitors to the home. Socialization of this dog type is crucial to prevent fear based behaviors later on. Both parents of the puppies will be healthy and happy dogs. Any good breeder will want to know about you and the type of home you offer. They will give health information and education on how to train a Shih Tzu. House training a Shih Tzu is paramount. Reward and positive reinforcement is how to train a Shih Tzu to toilet outside. It is also a good idea to introduce your dog to a cue word when toileting. This will give the dog the idea of what you want from him early on. Give your dog regular opportunity to toilet outside. The option to toilet can be as frequent as every hour to begin with. Always stay with him and watch him closely. Decide upon a cue word for toileting, something like “busy” will suffice. Each time your dog toilets outside use the cue word to associate the act with the command. Follow up the successful toileting experience with lots of praise and a tiny food reward or a quick play with a special toy. When your dog is used to the word association you can go outside and give the cue word before he toilets. After he has been follow the act with “good” (cue word) and reward. Your Shih Tzu will need sufficient attention and training to exercise his intelligence. If he is not provided with this opportunity regularly he will most certainly get into trouble. The under stimulated Shih Tzu will become grumpy and self-absorbed. He may destroy things and guard the furniture. Luckily despite his genetic stubborn streak the Shih Tzu loves to learn tricks and be entertained by children, remember though that young children should always be supervised with dogs. 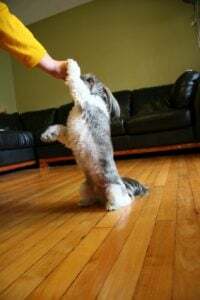 Alongside every other breed of dog reward, positive experiences and holding interest is how to train a Shih Tzu with success. This breed responds wonderfully to clicker training. The Yorkshire terrier is a wonderful breed. Small in size and stature but large of heart and personality the Yorkie is a great little dog. There is something special about the shining eyes and button black nose of the Yorkie. When you have experienced this breed of dog for any length of time you will certainly be hooked. Many Yorkshire terrier owners have multiple dogs and consistently have at least one Yorkie in the household. Unlike many other breeds of dog the Yorkie varies. Originally a working dog bred for rat catching and more recently bred as a small toy dog to be a pet. In recent years the teacup Yorkie has been introduced. This tiny dog is part of the handbag dog generation and unfortunately, due to this irresponsible fashion breeding, can be very unhealthy. How to train a Yorkie really is based on the size and breeding of your dog. The standard sized dog, which is about the size of a West Highland terrier, is hardy and can be preoccupied with the chasing of wildlife. The main issue to deal with will probably be recall. If you see someone shouting a dog’s name fruitlessly in an area of high wildlife, they are probably calling a terrier of some description. Often a Yorkshire and by this point the instinct driven dog is way beyond effective recall. Carrying a typical terrier nature this Yorkie can be indifferent to any request. When learning how to train a Yorkie to return on command, the most important thing to remember is his instinct. If you are teaching your dog to come back, do not take him to a place that is full of wildlife. Rabbits and squirrels will always take precedence over a leash and biscuit to this dog. Beware of rabbit holes as the incredibly driven Yorkie is not beyond a dig and tunnel for his quarry. How to train a Yorkie to return is by being completely consistent. Never give a terrier the chance to run away. The Yorkie is so intelligent that he will learn to ignore recall from the first time he manages to get away with it. Begin recall on the lead then a longer line and always give food reward. Practice recall in areas of low distraction and imagine an invisible circle around you. This will be the dog’s instinct circle and will move with you. Within the circle, your Yorkie will return on command if you are using sufficient reward. When he passes the invisible perimeter he will probably no longer listen to you. So it’s your job to learn his response distance and keep him within it or on leash. A whistle is a great idea for a terrier as they can become oblivious to a shouted name. You must associate the whistle with something the dog really wants for it to be effective or it too, will be ignored. Many terriers love squeaky toys and they can be used as an effective recall tool. A toy Yorkie is often not at all concerned about chasing wildlife. They often live happily amid other dogs, cats, hens and rabbits. Biddable and loyal, it can be surprising how different the toy Yorkie is from his larger standard Yorkie relation. Medium energy the toy Yorkie will happily exercise itself around the home and garden, yet is happy to do much longer walks. This little dog often stays close to its owner when out walking and is friendly to strangers. A toy Yorkie can develop a bossy nature and reactive response if not trained effectively. Trainers and behaviorists are often approached for advice on how to train a Yorkie not to guard the sofa or other furniture. A Yorkie that guards furniture may growl or snap if asked to move. If this is the case a thin house line attached to the collar is a much better option than direct physical touch of the dog. Keeping the house line on at all times, then taking the end of it to remove the bossy dog gently from the furniture, without paying him any attention will achieve the desired result whilst removing any need for direct confrontation. He should soon learn that guarding is fruitless. The Yorkshire terrier generally has an awful lot of self-belief which can become a problem if not channeled properly. Because a dog so small as the toy Yorkie can be picked up and moved easily it is tempting not to train them at all. This is a big mistake, all dogs regardless of size need guidelines and positive reward based training to know their place in the family home. 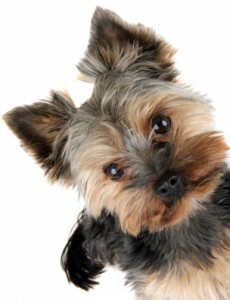 How to train a Yorkie effectively involves breed research, reward and positive reinforcement. Trained and stimulated properly, the Yorkie is a brilliant little dog. He is amusing, intelligent, complicated and sometimes challenging. He will teach you a lot about small dogs and regardless of his sometimes, frustratingly indifferent nature the Yorkie will be a dog that stays in your heart forever. The Labrador retriever is a simple dog. He asks very few questions and has much love to share around. He doesn’t have the high and often complicated intelligence of other working dog breeds. If, however, any dog breed had the capability for emotional intelligence the Labrador would be it. The Labrador is a gun dog who was originally bred to retrieve injured or dead birds after they have been shot. His specific employment is to carry the quarry in his soft mouth and often walk through wet and rugged conditions. The Labrador is still used regularly in this circumstance as well as being a popular and common family pet. This breed of dog is extremely trainable and with his loyalty and consistency is perfectly suited to a working life providing assistance to disabled people. The Labrador is trained as a guide, hearing and disability assistance dog in many countries. This breed of dog is also employed to work with police and in military circumstances to search for weapons, explosives, drugs and many other things. In fact any professional dog trainer in any field will be able to help you with how to train a Labrador. The dog’s behavior around food will need to be monitored. Most Labradors are often continuously hungry. Weight gain is probable if food intake is not monitored and this can put strain on joints and organs. This breed can have a tendency to believe that he must eat until bursting point. Luckily he will usually accept any type of food therefore carrot pieces or cherry tomatoes can be useful training treats. If this is not working it is worth taking training reward directly from your Labradors daily food allowance. The Labrador, particularly the female of the breed can develop spooking behavior. This will consist of growling or barking at a stimulus. Based in fear the spooking behavior is simply an instant reaction to a sudden and unexpected visual stimulus. It takes the form of instant surprise followed by a noisy defense. If spook barking is not handled correctly, the behavior can become complicated by the dog moving forward to the stimulus. Still based in fear this can be a dangerous habit to develop. Prevention of the behavior is paramount. By distracting your dog from anything that may cause a reaction, you will take away the element of surprise. When on walks with your dog, encourage him to look at you regularly. When he does, then reward and reinforce with a treat. Practice keeping his attention on you for as long as possible by using multiple treats and gradually withholding the reward. You can then utilize this by identifying possible trigger experiences before the dog does and keeping her attention on you until the trigger has passed. One of the main things to look out for when you are researching how to train a Labrador retriever is general manners. Your Labrador will jump up at everyone possible, if not trained otherwise. If you are seeking how to train a Labrador from puppyhood the most important thing to remember is that one day this cute puppy will grow up. The Labrador loves human contact and can easily grow into a bouncy and hazardous adult dog. 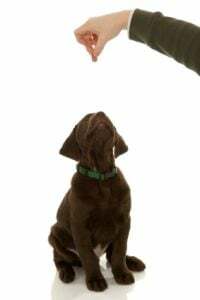 Because it is tempting and easy to lean down and praise a puppy that is small and cute, the dog as a youngster often learns that jumping up brings reward. By the time he begins to grow, this behavior is established and the owner does not know how to deal with his behavior. Eventually the dog becomes a 65lbs (30kg) lump that is persistent in his jumping up because it always worked for him before. Luckily, how to train a Labrador to keep all four paws on the ground is easy with minimal research. You need to teach him an alternative behavior. With food reward and positive reinforcement this should be easy. Sit on greeting is a great alternative to jumping up. There are many options to use when working out how to train a Labrador to sit. Clicker training is a great reinforcement technique, particularly for the Labrador and his insatiable hunger. When it is confirmed in his mind that sit brings food reward your Labrador will offer it whenever he senses food in the general vicinity. You will then need to add a command word. “Sit” is the obvious one. When your Labrador greets you then utilize the word sit and your treats before he jumps up. Timed properly this will work. 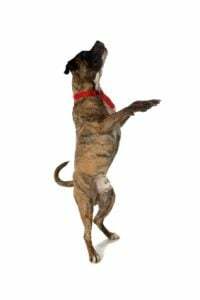 If your dog jumps up or tries to grab for the treats simply turn away and hold the food above your head. He will soon learn that it is more rewarding to greet you nicely than with the extra gusto of previous occasions. Beauty and brains unite in the Siberian husky. Bred to pull sleds for many miles in arctic conditions, this breed of dog is becoming increasingly popular as a family pet. With an appearance similar to that of the white wolf and great strength of body and mind the husky is a canine to be admired. 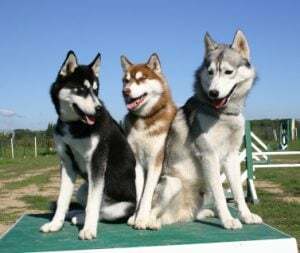 If you are new to the breed and are thinking of offering a home to a husky, intensive research on how to train a Siberian husky is advisable. You will need to provide this type of dog with a particularly understanding and active home. An unstoppable intellect and intense need to be physically and mentally occupied is a prominent trait of the husky. Bred to live and work in freezing conditions, midsummer heat can be particularly uncomfortable and dangerous for your dog. Training sessions should be catered around the dogs need to be as physically cool as possible. Learning the theory on how to train a Siberian husky will probably not prepare you for the practicality of the exercise. Intelligence, stubbornness and the questioning nature of your dog may prove frustrating. Your husky will learn a trick quickly and soon become disinterested if asked to repeat it too often. Training sessions could easily become a case of you saying “jump” and your dog asking “why”. The answer to the question, how to train a Siberian husky, is as simple as this; Treat him as an intellectual equal. Be aware that he only needs a small amount of positive reinforcement and reward based training to learn something new. The husky will only respond to positive handling and training. He will work out what you want from him quickly and with minimal effort. Your job is to work out how to motivate him to repeat his prior learning when required. There is absolutely no point in persevering on a training stalemate situation with your husky. His stubbornness will prevail and training will become a frustrating exercise. If your request is falling on deaf ears, then change tactics to achieve your desired result. If you are asking something of him and the request is being met with lack of interest, then briefly ask for something else and reward him on delivery. You will take him by surprise which can then be used to coerce him into the previous request. How to train a Siberian husky, along with any other super intelligent yet independent breed can take thought and a little trickery. Recall – How to train a Siberian husky to come when called. Recall can be one of the main problems with this breed. Unsurprisingly as their nature says run in a straight line. Just as a Labradors nature says pick something up and a terriers instinct is to shake an object around. Knowing how to train a Siberian husky to come when called and actually being able to get an off leash husky back on request can be very different. Traditional recall training is a must with this breed. It is certainly not advisable to let your husky off the leash and hope for the best. Begin by recalling on the leash and always reward your dogs return. Vary your reward to keep the dog interested. He will soon become bored of the same treat. A squeaky or other noisy toy may be good motivation. Introduce a long line to allow your dog to run. Your husky must be allowed to run otherwise he will be unhappy. A life of leash walks is not how to train a Siberian husky. A long line can be made of any type of rope or cord, keep in mind though that it could be slipping quickly through your hands at some point so choose a fabric that is less likely to burn your skin. Most pet stores carry what is called a cotton web long line, it’s a great inexpensive option. When you are certain that your dog will return to you on leash leave the long line attached to his collar and remove the traditional leash. Increase the distance of recall gradually but still maintain in control by holding onto the long line. Eventually and only when confident, you can drop the long line on the ground and practice recalling your dog in the traditional manner. At this point the long line is your insurance policy. Progression from long line work will be short recall off leash. You can also shorten the long line until you no longer need it. Training often and several times a day is the best to train your husky to return on command. By living with and learning how to train a Siberian husky you will certainly learn a lot about canine behavior. You will also benefit from the necessary research of many positive reinforcement dog training techniques. How to train a Golden Retriever with kindness. The Golden retriever. A wonderful big bear of a dog with the heart of a lion. A sturdy breed of dog that is a favorite as a family pet. Generally trustworthy, the golden is a happy and unquestioning dog. Many fans of this breed have multiple golden retrievers in their households. A visitor to any home containing a golden retriever will receive a warm welcome from the dog. Usually, alongside the offer of a carried toy or borrowed item of footwear. A well and responsibly bred retriever will be a healthy and happy dog. Health risks are predominantly arthritis, hip dysplasia and the joint pressure of weight gain. Alongside others in the retriever group the golden enjoys his food. Working out how to train a golden retriever should not take you far passed the dog biscuit cupboard. Originally bred for retrieval of game during shooting activity. The versatile and friendly nature of the golden has led to it being trained in many roles. Dogs of this breed are employed as guide dogs for blind people and assistance dogs for people with other disabilities. Police and military also often employ golden retrievers as search and detection dogs. In comparison to some other working breeds the golden retriever will need less mental stimulation. Not because he is any less intelligent, as he certainly isn’t but because he is a steady and content dog that is equally happy to learn or relax. Good with other dogs, the golden retriever enjoys canine interaction. Because he is bred to travel long distances on foot to fetch and carry injured game birds, the golden retriever will need a lot of exercise. Researching how to train a golden retriever will show that this dog will respond well to reward based dog training techniques. Your golden is not overly complicated and is intelligent enough to figure out that it is to his benefit to repeat any behavior that is reinforced by a food reward. Tune your dog into the sound of the clicker. Your aim is to ensure that your golden looks to you for a food reward every time he hears a click. You can do this easily by introducing the sound and promptly following it with a treat multiple times over two to three ten minute dog training sessions. Test the effectiveness of the click sound by waiting until the dog is looking away from you, and then pressing the clicker. If he looks at you immediately for a treat, then your dog is tuned into the sound. If little attention is paid to the click then you will need to continue the tuning in process. Once the click is properly conditioned, you can use it to encourage your golden to repeat any behavior that you would like it to regularly offer. You can research how to train your golden retriever with a clicker and positive reinforcement .You will find many tricks that you can teach your dog. The main thing to remember when deciding how to train your golden retriever is that a click should always result in a treat. Regardless of which behavior you may have reinforced with the sound. Resource guarding and possession of food items or other objects should never be directly challenged. Teach your dog to swap any resource from an early age and never place a lot of value on any one item. Confrontation or punishment is not how to train a golden retriever with success. Positive reinforcement and reward is essential when training your dog. Bite inhibition should be taught to every puppy. The mother dog will allow her puppies to mouth her in play and interaction but will correct with a yelp or nip if the bite from her young is too hard. A dog with low bite inhibition does not realize the difference in the severity of a bite. Low bite inhibition means that a biting dog will bite hard. Researching how to train a golden retriever bite inhibition is a must with any new puppy. A pocket of treats and a teddy bear with a squeak will probably ensure the most effective results when working out how to train a golden retriever. This delightful breed of dog will do anything for a biscuit and an extra ear rub. The German shepherd dog is beautiful. An intelligent canine from working descent, he will bond with and protect his handler with courage and conviction. 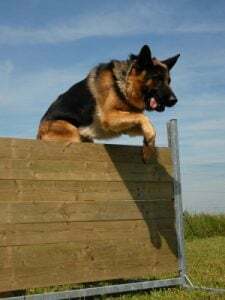 This breed of dog is employed by police and military within roles ranging from crowd control to tracking and physical capture of an escaping subject. The German shepherd can make a wonderful family pet and when choosing a particular dog, it is important to keep in mind that many suffer from hip dysplasia and related problems. This is normally due to irresponsible breeding. Both parents of a litter should be hip scored before mating. When taking on an adult dog certainly check the gait. If the dogs back slopes downwards towards the tail it may have a problem with hips due to excess pressure. It is not always possible to see potential hip problems but sometimes they are obvious. A biddable and handler focused dog, this breed is a pleasure to train. Extensive research on how to train a German shepherd dog is not always necessary. Positive reinforcement and reward based training is however essential. Train your German shepherd with a suitable reward. His intelligence will ensure timely response and keen learning. Clicker training is a perfect tool when deciding how to train a German shepherd dog. Train a German shepherd Dog with Positive Reinforcement. Clicker training works on reinforcing positive behavior with a reward. The dog must first learn that a click always provides a treat. Then the behavior that you would like him to repeat is pinpointed with the sound. Any unhelpful behavior is ignored completely as this will encourage the dog to offer the behavior that provides him with the click and reward. The high intelligence of this breed ensures that he will pick up this type of training quickly. When learning how to train a German shepherd dog with a clicker, you must first ensure that your dog is completely in tune with the sound and always expects a treat after hearing it. If the dog is not rewarded every single time, then the sound will lose its effectiveness. Also, if you click at the wrong time, you must still provide the treat despite the unhelpful behavior that you may have unwittingly reinforced. The German shepherd is handler focused and obedient by nature. As they mature and if trained well they rarely go far from the person they are out with. Before bringing your dog home for the first time, take some time to research how to train a German shepherd dog on walks and recall. Practice calling him back for rewards on the leash initially. Extend the leash to a long line and continue to practice recall. Only if you are certain that the dog will return on command, should you begin to let him off the leash. Socialized well they can accept other dogs and play with little concern, but the primary focus is often their human family. Be aware that a German shepherd is protective by nature. It is for this and their fearlessness that they are employed in guard dog roles. Your dog may guard the person holding its leash and everyone within the family including children. This should always be discouraged by regular and careful socialization in varied situations. The German shepherd can be a reactive breed that could bark or snap relatively quickly if he feels threatened or cornered. Keep this in mind when deciding whether or not you should welcome a German Shepherd into your home. Overall, the German shepherd as all other dogs can be a wonderful family pet if properly trained and socialized. Noble, loyal and stunning to look at ensures that as a breed type, they automatically command a certain respect.